It is often difficult for parents to choose the right school for their children. The ideal school offers children a safe, nurturing environment and supports their inquisitive nature. If this sounds like the kind of school you are looking for, then consider choosing a Montessori School. Montessori education recognizes that academic achievement does not occur in a vacuum. A truly comprehensive education supports the development of the whole child, including his or her socio-emotional development. Montessori Schools are uniquely designed to give children the benefit of a large, yet close-knit community. The multi-age classroom groupings allow younger children to look up to the older children for guidance and assistance. Older children reinforce what they know by helping the younger children. This arrangement facilitates important social skills such as cooperation, collaboration and leadership. For many parents, teaching children the value of respect is a priority. Like other aspects of Montessori education, children learn the importance of respect in an active, engaged manner. The Montessori Guides do not treat the children as lesser people to be controlled, but rather as fellow humans to be respected. Likewise, children learn to respect the Guides, their fellow students, and themselves. 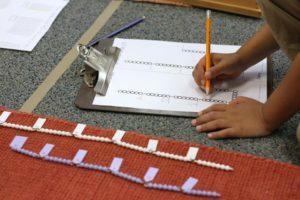 In a Montessori School, children have the ability to learn at the pace that works best for them. This is because children explore learning materials at their own pace, only moving on to more difficult lessons once they have mastered the basic concepts. Self-paced, guided-learning prevents gaps in a child’s education and greatly reduces frustration for him or her. Montessori Schools do follow a curriculum and Montessori Guides do present lessons to children. However, the learning experience is highly individualized. Students are able to select their learning activities each day from a range of carefully prepared choices. They become engaged in the learning experience because they are able to pursue their passions. If you would like to learn more about the many benefits of Montessori education at Starwood Montessori School, you can contact us at (972) 712-8080 to schedule a tour of our school.